As a teacher, it is part of my job to challenge my students, not only in how they think but also in the ways they work with Spirit. Once such challenge is getting them to think outside the box and to stimulate interaction with Spirit that does not engage their thought processes or ego. 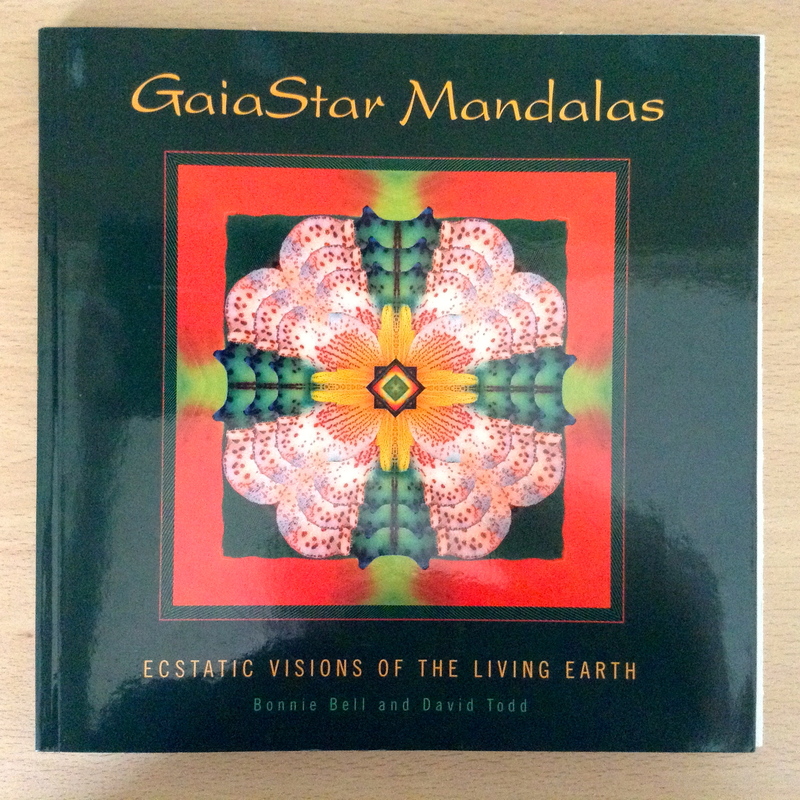 Many years ago I came across a second-hand book called GaiaStar Mandalas by Bonnie Bell and David Todd. The minute I opened the book my mind was full of ideas and ways to use these amazing pictures. Of course, I purchased the book which included page after page of richly coloured stunning mandalas made from natural materials; such as leaves, petals and feathers. Once home I asked the book for permission to take it apart so I could use each image on its own; I then proceeded to delicately cut the book up using a scalpel. I now use these wonderful images to as inspirations for connection with Spirit and Self, as well as topics and ideas for them to speak or write about. In a recent automatic writing class, I asked my students to work with the images and we got some lovely pieces of writing. Often when my students write I do too – below is the piece Spirit wrote via me inspired by the books cover. ” Orange – pulsing life – radiating joy and abundance – strong yet gentle – beating and retreating the playful journey through life. Beating a path, then retreating to see your creation. Creation and growth. Stimulating. Developing. Transforming. Life has many variations. Many layers and transitions. The sacral chakra holds emotional energy, it speaks the emotive language. Translating that into physical sensations and urges as well as thoughts and ideas. You are emotional beings. Embrace the idea. Embrace your emotional side and feel the flow of it through your physical body. The shudders that come with laughter and tears. The ripples and butterflies that come with pleasure and love. Your mind will always aim to translate these sensations, to rationalise and analyse. But do not be lead by that. It is only a variation of the experience. It is not the whole story. Emotions do not rule you. Your soul governs your learning and path and the emotions are its tools, theories, concepts, perspective and language. The soul knows how to flow through the emotional landscape. Better than your mind, more clearly than your body. They are both one-sided in their view of emotions and applications. Through the cohesion of all the soul has a rich canvas on which to paint and explore. Which in turn enriches and deepens the learning. Each emotion adding a colour or texture to the piece. The masterpiece that you call your life. It is an important chakra and colour. Yet you work so little with either. Or so you think. How many sunsets have you watched? All those deep oranges seeping into your energy. How many tears have you shed cleansing your emotional self as it passes through the phases of learning? How many nights spent reviewing your life, letting your mind and ego judge your emotional learning. You choose so many ways to see yourself. But few honour your emotions. You judge being emotional as weak. We say it is not. We remind you it is powerful, insightful and needed. Your soul is grateful for every emotion experienced and felt. We say to you be the same. Rejoice in them, respect them and appreciate them more. With that comes greater learning and understanding. Not only for your soul but for humanity.